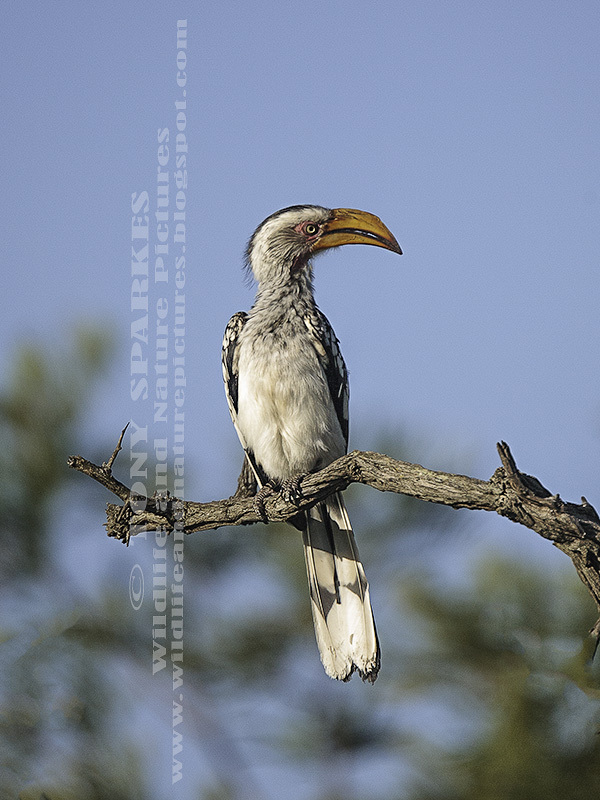 The Southern Yellow-billed Hornbill (Tockus leucomelas) is one of about 10 Hornbill species that can be found in South and Southern Africa. The Southern Yellow-billed Hornbill is along with the Red-billed Hornbill the most common of the Hornbill species in South Africa. The Southern Yellow-billed Hornbill is found mainly in broad leaf woodland which in South Africa is in mainly in the far north east of the country. The Southern Yellow-billed Hornbill is a medium sized bird around about 50-60cm (18-24in) in length and feeds on the ground catching spiders,insects, scorpions and seeds. The female Southern Yellow-billed Hornbill nests in a suitable hole or hollow in a tree which is sealed up by the male with as small gap from which he feeds her through. The female Southern Yellow-billed Hornbill also looses all her feathers while sealed in her nest hollow. Therefore if something should happen to the male Southern Yellow-billed Hornbill the female would not only starve also possibly her chicks, but she would also not be able to get out and fly away or feed herself.